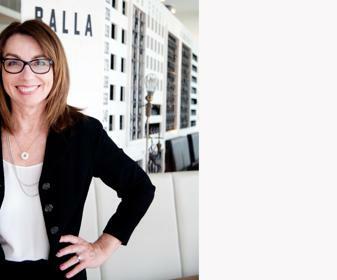 After the recent opening of her restaurant Balla at The Star, we talk with true restaurateur, Julie Manfredi Hughes. Julie has played a key part in the direction and refinement of Sydney’s dining experience since the opening of Restaurant Manfrediin 1983 and bel mondo in 1996. Now as the Managing Director of Manfredi Enterprises, she has managed the creation ofEspresso di Manfredi by Piazza D’Oro and Ceramica di Manfredi and, together with her business partner Stefano Manfredi, has been instrumental in many restaurant projects across Sydney. Their latest project, Balla, is set to bring a little piece of Milan to the newly opened The Star. Here, Business Chicks talks with this true restaurateur to find out what’s important and what it is that inspires her. How did your fascination with food and restaurants begin? As a child, I have very strong memories of visits to the city with my family to celebrate important occasions like birthdays. This would always involve an outing to a restaurant or dinner and a show. I loved the dressing up and the conversations around the table. As a school student and later as a university student, I worked in restaurants and I always loved to cook and play mother for the others in the share household. I was lucky and travelled to Europe for a gap year after finishing school and my eyes were opened to art, architecture, music and fashion. So began a love affair with Italy, and an appreciation for design that has underpinned my fascination with restaurants ever since. This fascination grew following my first visit to Berowra Waters Inn in 1981. A subsequent trip to Italy in 1985 after Steve and I had opened The Restaurant in Ultimo sealed the deal. We dined at Gualtiero Marchesi in Milan and Enoteca Pinchiorri in Florence and life as I had known it was never the same again. You’re responsible for the distinct aesthetic approach that defines the Manfredi brand; why is this side so important to you? For a restaurant to be successful and to make a mark, it has to work as a total concept and offer a total experience. A great restaurant comes about because the restaurateur truly has something to say that comes from the heart, and every aspect of the experience belongs to that. The rules of brand management and marketing are easily applied to the creation of a restaurant, however they must be applied in such a way as to enhance what the restaurateur has to say, not instead of. The creation of a successful restaurant brand is not just the sum of its parts – there must be a binding vision that drives the process. The aesthetic approach is one such binding vision, where the brand is driven by core values and personal judgments of sentiment and taste. For example, at Bells at Killcare there is a beauty and romance in the natural environment, a nostalgia, and that is the inspiration, the key driver. On the other hand, Balla is a modern, fresh and fun urbane approach to the brand, with inspirations from the Italian Futurist Art movement and the cosmopolitan city of Milan. To create that sense of occasion that inspired me as a young girl, I approach the creation of a restaurant as if I am creating a new world. When you walk into a restaurant, you should experience a sense of transformation. When working with architects and designers, my motivation is to do so on every detail in order to create that magic reality. Likewise in working with the front of house staff, the service must be seamless for the magic to take place. The market you’re in is largely saturated; how do you ensure the venues under the Manfredi name rise above the masses? There is risk involved and it’s important to be brave. Before embarking on a venture there is research, there is the formulation of a strong brief and there is the desire to hit a nerve, to fill a gap in the market, and to do it in our own distinct way. Then there is the ongoing attention to detail and quality management. Of course, there is also a kitchen with Stefano Manfredi at the helm and that is a pretty sure bet. Your business partner, Stefano Manfredi is your ex-husband. This is certainly not a conventional partnership; how do you make it work? Firstly, I am not so sure any more that it’s a particularly unconventional relationship. What is unconventional is you deferring to Stefano as my ex-husband. It’s usually the other way around, where I am referred to in reference to him as the ex-wife, come something or other, or indeed most commonly not mentioned at all. However, putting the politics of the sexes aside, business relationships are not easy. Stefano and I have the advantage of knowing each other very well, of knowing the very best and the very worst of each other. There are no surprises. We have complimentary skills and we just get on with it. What is the best piece of advice you’ve been given so far? The best piece of advice was given to me in 2002 by an important and generous mentor who assisted me during the sale of bel mondo. He said, “You know Julie, the best option is rarely the soft option”. In other words, make the hard decision, take the pain and move on. What advice would you give to women who are aspiring to break into the food industry like you? If you want to make your mark, then do it. You must educate yourself well and that includes outside of the kitchen, whether it be in business, hospitality, marketing or design. And you have to be prepared to work incredibly hard, perhaps sacrificing what other people may take for granted, like time off!